The USB Implementers Forum (USB-IF), this week announced a rebranding of the USB 3.0 and USB 3.1 specifications, under the USB 3.2 specification. As outlined by Tom's Hardware, USB 3.0 and USB 3.1 will now be considered previous generations of the USB 3.2 specification. If the swap between USB 3.1 Gen 1 and Gen 2 to USB 3.2 wasn't confusing enough, each of these specifications also has a marketing term. The new USB 3.2 Gen 1 with transfer speeds up to 5Gb/s is SuperSpeed USB, while USB 3.2 Gen 2 with transfer speeds up to 10Gb/s is known as SuperSpeed USB 10Gbps. The USB 3.2 Gen 2x2 specification with transfer speeds up to 20Gb/s is known as SuperSpeed USB 20Gbps. Make sure to check out the comparison table on MacRumors to admire the full extent of these changes. As someone who's been experimenting with USB-C accessories compliant with the USB 3.1 spec over the past few months, I can't even begin to stress how confusing for the average consumer all of this stuff can be. It took me days to wrap my head around the differences between the physical USB-C connector, the underlying specs it can support, and the DisplayPort compatibility mode – and I do this for a living. In my experience, if you're looking to buy modern USB accessories compatible with an iPad Pro or MacBook Pro, you're better off looking for a technical spec label rather than the "friendly names" such as "SuperSpeed", which manufacturers often fail to mention in their spec sheets. Until today, if you wanted to buy USB-C accessories supporting the highest data transfer rates on the 2018 iPad Pro, you had to look for devices compliant with USB 3.1 Gen. 2; with today's rebrand, the 2018 iPad Pro supports USB 3.2 Gen. 2 for transfers up to 10 Gbps, but not the similarly-named USB 3.2 Gen. 2x2. I'm sure this is going to be so easy to explain to someone who's looking for the "fastest" USB-C cable for their iPad Pro. My main Mac is a 2016 MacBook Pro, which isn’t ideal. The problem isn’t really the laptop itself, it’s that my needs have changed. You see, in 2016 I was commuting to downtown Chicago every day and I wanted a portable Mac for working in Xcode and other tasks on the go. Now, I work from home and my MacBook Pro sits in clamshell mode most of the time. It’s handy to have the MacBook to take with me when I need it, but that’s far less frequent than it used to be. Instead, my Mac drives a 27” LG 4K display, is connected to Ethernet, speakers, a Luna Display dongle, my podcasting microphone, and various other peripherals I need from time to time. The trouble with the setup is that I quickly ran out of USB-C ports even though my MacBook Pro has four. I’ve tried several different configurations to streamline my setup, but none were quite right. Now though, I’ve finally found a solution that comes closest to meeting my needs and has the added benefit of working well with my iPad Pro. 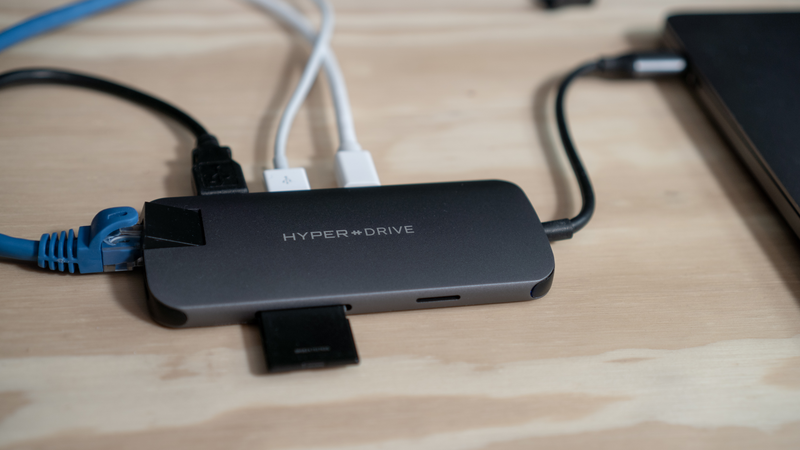 With a couple of minor caveats, the HyperDrive Slim 8-in-1 USB-C Hub is the best solution I’ve tried. One of my favorite aspects of working on the iPad is the flexibility granted by its extensible form factor. At its very essence, the iPad is a screen that you can hold in your hands to interact with apps using multitouch. But what makes iPad unique is that, unlike a desktop computer or laptop, it is able to take on other forms – and thus adapt to different contexts – simply by connecting to a variety of removable accessories. 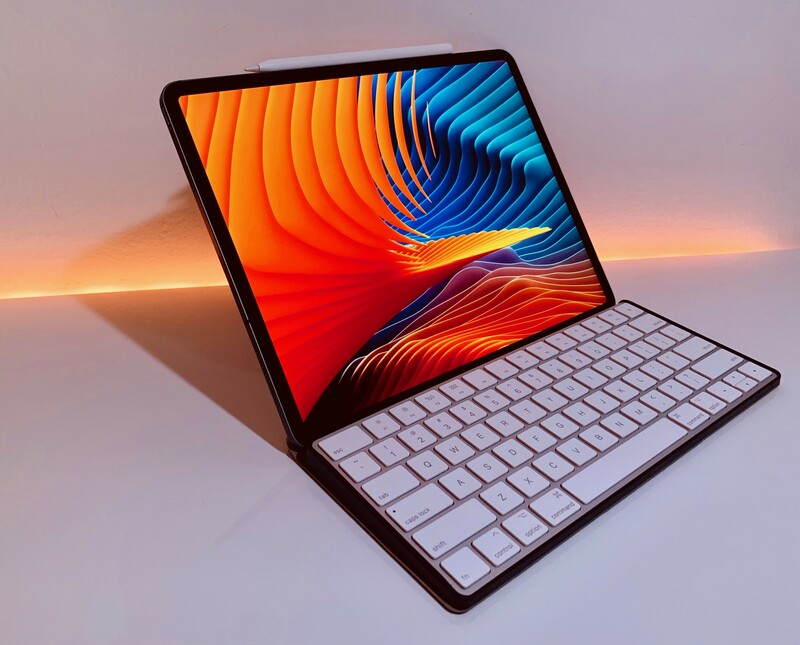 The iPad can be used while relaxing on a couch or connected to a 4K display with a Bluetooth keyboard; you can work on it while waiting in a car thanks to built-in 4G LTE, or put it into a Brydge keyboard case and turn it into a quasi-MacBook laptop that will confuse a lot of your friends who aren't familiar with iPad Pro accessories1. In a way, the iPad is modern computing's version of Kirby, the famous Nintendo character that is a blank canvas on its own, but can absorb the capabilities of other characters when necessary. Thanks to its USB-C port, the new iPad Pro takes this aspect of the traditional iPad experience even further by enabling easier connections to external devices that don't come with a Lightning connector. At this stage, the new iPad Pro does not integrate with all USB-C accessories like any modern Mac would; also, connecting to Bluetooth keyboards has always been possible on iPad, as was interacting with external USB keyboards if you had the right Lightning adapter. But the point is that USB-C makes it easier to connect an iPad Pro to other USB devices either by virtue of using a single USB-C cable or, in the case of USB-A accessories, using existing USB-C hubs from any company that isn't Apple. Not to mention how, thanks to the increased bandwidth of the USB 3.1 Gen. 2 spec supported by the iPad Pro's USB-C port, it is now possible to connect the device directly to an external 4K/5K USB-C monitor, which can power the iPad Pro and act as a USB hub at the same time. We haven't seen the full picture of built-in USB-C with the new iPad Pro: external drives still aren't supported by iOS' Files app, and other peripherals often require app developers to specifically support them. However, I believe the removal of Lightning is already enhancing the iPad's innate ability to adapt to a plurality of work setups and transform itself into a portable computer of different kinds. For the past few weeks, I've been testing this theory with Bluetooth and USB keyboards, a 4K USB-C monitor, USB-C hubs, and a handful of accessories that, once again, highlight the greater flexibility of the iPad Pro compared to traditional laptops and desktops, as well as some of its drawbacks. 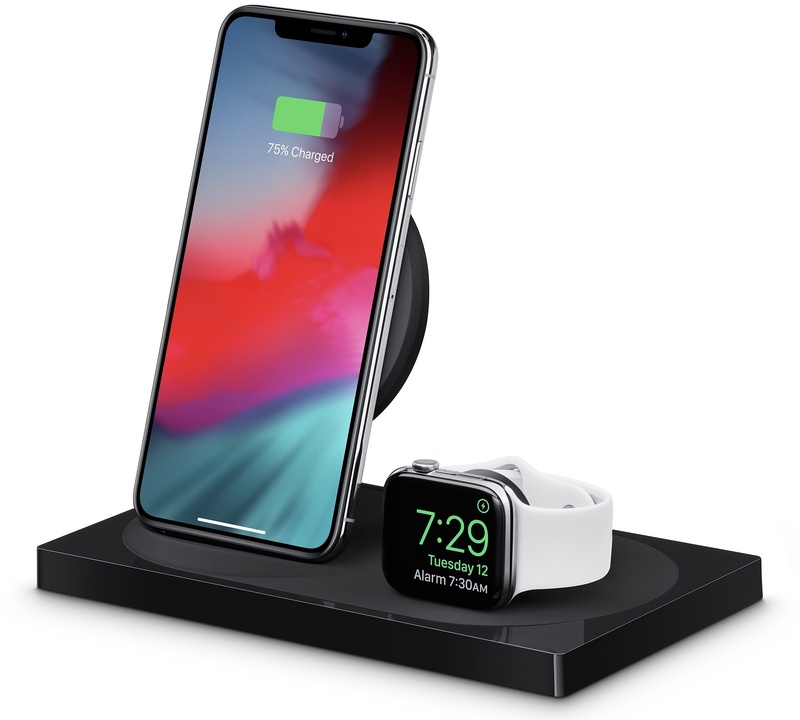 In addition to Apple's clear case for the iPhone XR and 18W USB-C adapter, Apple online stores in Europe started selling Belkin's highly anticipated Boost Up dual wireless charging dock and USB-C to HDMI adapter earlier today. Still, the Wall Street Journal would appear to be a more visible and reputable source than an analyst or blog with some sources in Apple’s supply chain. It’s generally considered to be one of the places where Apple has itself tactically leaked information in the past. So let’s take a moment and consider this rumor seriously. What would drive Apple to kill the Lightning connector, and why would it keep it around? I've been going back and forth on this since yesterday's report on The Wall Street Journal. Like Jason, I see both positive aspects and downsides to replacing Lightning with USB-C on the iPhone, most of which I highlighted on Connected. Jason's article perfectly encapsulates my thoughts and questions. USB-C represents the dream of a single, small, reversible connector that works with every device, and it's being adopted by the entire tech industry. USB-C isn't as small as Lightning but it's small enough. More importantly, it'd allow users to use one connector for everything; USB-A, while universal on desktop computers, never achieved ubiquity because it wasn't suited for mobile devices. USB-C is. Conversely, Lightning is under Apple's control and Apple likes the idea of controlling their stack as much as possible (for many different reasons). A transition to USB-C would be costly for users in the short term, and it would be extremely perplexing the year after the iPhone 7 fully embraced Lightning. Furthermore, unlike the transition from 30-pin to Lightning in 2012, Apple now has a richer, more lucrative ecosystem of accessories and devices based on Lightning, from AirPods and Apple Pencil to keyboards, mice, EarPods, game controllers, Siri remotes, and more. Moving away from Lightning means transitioning several product lines to a standard that Apple doesn't own. It means additional inconsistency across the board. Like I said, I'm not sure where I stand on this yet. These are discussions that Apple likely has already explored and settled internally. I'm leaning towards USB-C everywhere, but I'm afraid of transition costs and setting a precedent for future standards adopted by other companies (what if mini-USB-C comes out in two years?). In the meantime, I know this: I'm upgrading to USB-C cables and accessories as much as I can (I just bought this charger and cable; the Nintendo Switch was a good excuse to start early) and I would love to have a USB-C port on the next iPad Pro. If there's one place where Apple could start adopting peripherals typically used with PCs, that'd be the iPad.